This announcement actually amounts to far less than meets the eye, but it could well also mark a tectonic shift in the health care landscape. It is less than meets the eye because the data enabled is a mere trickle compared to the torrent of health care data that we all generate during our medical visits. It’s also only a uni-directional data flow from the health care institutions — the hospitals, the medical practices — to your personal health record. Data will not flow in the other direction. You cannot update an incorrect observation in your health record, nor can you add missing facts or missing medications to your "official" health record. At least, not yet. It’s also not a magic switch that will allow everyone access to their health care records. It requires that hospitals agree to work with Apple to provide this data at a reasonably timely interval or on demand. Currently, only a small number of hospitals have agreed to do so. So why might this announcement be earth-shaking? Because it represents the first time a mass consumer platform that is in the hands of tens of millions of consumers daily and for hours on end — the iOS operating system — will get officially sanctioned health care observations from the formal institutional health care system. This immediately enables a number of productive, cost-saving, pain-saving and even life-saving scenarios. • First, when you show up at a health care system other than the one you normally visit and see an unfamiliar doctor or nurse, this data will let you speed up and make much more accurate the getting-to-know-you phase of the visit. It will help you avoid repeated, unnecessary, expensive and painful testing. • Now that our data is on this accessible platform, we’ve opened the gates to a world of innovators — some commercial, some nonprofit — to provide decision support, advice and recommendations based on these accurately and authoritatively transmitted health care data. For example, genetic tests are mostly reported these days without the genetics company knowing your health care details or sometimes even your age. Now, with the clinical information that you can make available, you can give permission to these third-party applications or apps on your iPhone to access these crucial health data. These companies will now be able to deliver interpretation of your results that are not generic but truly customized to your particular circumstance, just as has been promised to us under the rubric of precision medicine. • Third-party telemedicine services such as Teladoc or AmericanWell currently allow you to speak to a licensed doctor, including a video connection, within minutes using your smartphone to get a clinical opinion. Now, they will not have to rely only upon the patients' recounting of their signs and symptoms, or their recollection of laboratory tests or scraps of their record that they have available. These will be able to be presented in an integrated fashion as part of the telemedicine encounter, which will thereby enable essentially the practice of medicine across state barriers in a way that has previously been artisanal at best. The fundamental shift that is enabling this transition is the selected health care systems that have voluntarily agreed to transfer data in a well-formatted, accurate messaging that can be represented faithfully on the digital consumer platform. This represents a major crack in the previously implicit understanding between electronic health record providers and health care systems that data about their patients would only travel in ways that would not increase the ability of patients to get health care elsewhere. Companies have attempted multiple workarounds to attain this goal, but this represents a major step forward: Now, it’s the electronic health record systems themselves and the providers that are enabling this to happen. Of course, this was functionality that was mandated multiple times by U.S. legislation, but there always were apparently small details that limited the actual implementation. So has the new era arrived yet? This announcement is the clarion call, but it may not be the new age yet. It remains fragile in that health care systems can choose to participate or not to participate. The health care record vendors can choose to be more helpful or less helpful to this effort. New regulatory obstacles may be placed to limit the use and reuse of this data. But the mere fact of this small beginning shows that it is technically and organizationally possible. In this era when we expect access to information that is important to us in all parts of our lives — from the news, to our financial information, to our personalized weather — the shift to similarly fluid access to our medical data and the creation of a far larger ecosystem of interpretation and health care decision making will gain increasing support. It will undoubtedly generate business plans and enterprises seeking to birth their unicorns into this $3 trillion sector of the economy representing one-sixth of our gross domestic product. Furthermore, because the data-messaging standards that are used in this system were developed not by Apple but by a community of informaticians and data scientists working with various research entities such as the National Institutes of Health, these standards are open, so other consumer health platforms such as Google’s Android should have no particular problem in immediately following suit. Full disclosure: I have a dog in this fight. I worked with colleagues at Harvard and Boston Children’s Hospital to develop automated consumer access to health-record data with funding from the NIH and the Office of the National Coordinator for National Projects such as the huge study All Of Us. 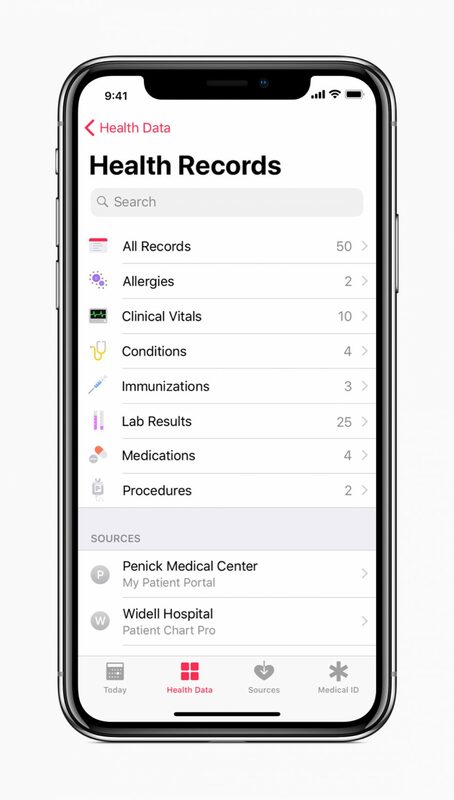 But I am also a doctor and a patient, and I can tell you what I'm planning to do with this new Apple capability: Develop an app to tell any patient with enough data on their iPhone what questions they should ask their doctor about their diagnosis.